Restoration work at the site of the empty tomb in the Church of the Holy Sepulchre will be finished by Easter, the Franciscan Custody of the Holy Land has announced. Restoration work on the “Edicule”—the shrine at the site where Jesus was buried—has taken nine months and cost $3.3 million. The costs were borne by the Franciscan Custody, the Greek Orthodox Church, and the Armenian Orthodox Church. Jordan’s King Abdallah II made a personal donation to support the work, as did Palestinian President Mahmoud Abbas. An ecumencial celebration on March 22 will mark completion of the work. 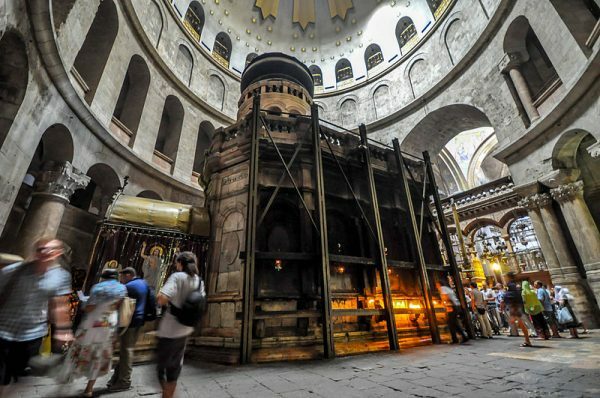 Although the Edicule itself is now stable, experts say that another extensive renovation project is necessary to address the problems that damaged the structure: the excess humidity and smoke from candles in the ancient Jerusalem basilica. The Vatican has promised “substantial” support for that project. During the restoration of the Edicule, workers who were close to Jesus’ tomb reported odd phenomena, including a “sweet aroma” and malfunctioning of electronic instrucments, suggestive of a powerful electromagnetic force.